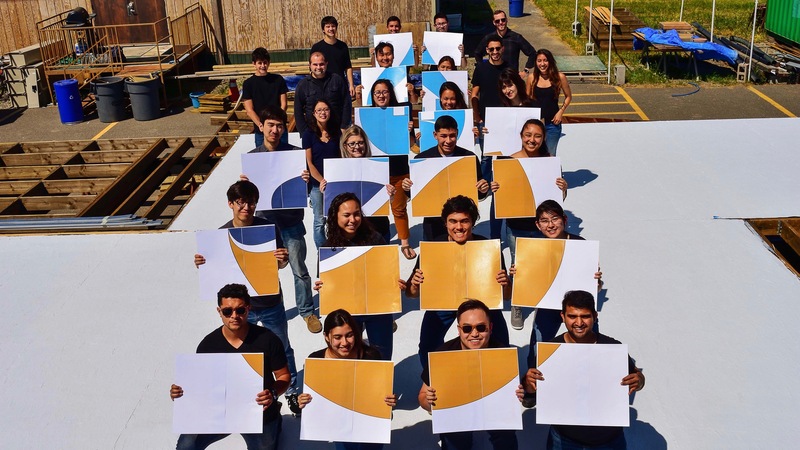 For the U.S. Department of Energy Solar Decathlon 2017, the University of California, Davis team has designed Our H2Ouse (pronounced “our house”) as a response to the terrible drought that gripped California in recent years. In addition to being ultra-energy-efficient, Our H2Ouse is designed to dramatically reduce potable water use—helping California residents better prepare for inevitable drought in the future. Our H2Ouse supplements water and energy-efficient technologies with feedback displays to help occupants improve their own end-use behavior. The feedback also compares usage in Our H2Ouse to its larger community, thereby proposing a paradigm shift in which sustained resource conservation is the shared goal of the house, its occupants, and the surrounding community. Recognizing the water and energy problems plaguing California, the UC Davis team developed Our H2Ouse to create feasible and desirable homes using California-specific strategies. The three founding design pillars of Our H2Ouse are drought resilience, education, and inclusiveness. Whereas Our H2Ouse displays new and innovative technology, it also works hand-in-hand with current technologies. And it addresses the most pervasive and unpredictable factor in energy and water savings: user behavior. This strategy can exploit the efficacy of “smart” technologies and bridge the gap between potential and realized water and energy savings. In addition to its emphasis on water conservation and the use of critical feedback displays, the team also chose an industrial modern-rustic design that evokes both the urban and rural ways of life in California. Because the “urban vs. rural” dilemma is often at the center of discussions about water in the state, this aesthetic choice further reinforces the water theme. The team’s primary focus is water conservation, and the house is designed to use 50% less potable water than a typical residence. Visual and physical feedback on energy and water use employs recognizable units and uses community-scale information sharing to raise occupant awareness and tap into potential collaboration or competition with other houses/neighbors. A building envelope constructed from a 12” thick, bamboo-based, panelized exterior wall system and structural insulated panels (SIPs) results in the house having a fraction of the carbon footprint of a standard residence. The house features greywater reuse systems, including a cutting-edge sanitization technology developed at the university. Sophisticated monitoring and feedback systems educate and inspire residents to be the champions of their own water reduction. Feedback mechanisms ensure that residents can participate in community-wide conservation efforts and live healthier and simpler lives. Motion-triggered recessed circadian LED floor lighting lends a modern, yet cost-conservative touch. A single wet module not only reduces heat loss from water lines, it also allows for all interior plumbing connections to be made before transport. Our H2Ouse targets the real estate markets of Sacramento (urban) and Yolo (rural) counties, both of which exhibit the trends that feed the UC Davis team’s three design pillars of drought-resilience, education, and inclusiveness. As the state capitol, Sacramento is ground zero for the implementation of recent legislation aimed at increasing water and energy efficiency standards. Yolo County lies in direct proximity to Sacramento County and is also home to UC Davis, a public university that houses the United States’ largest planned zero-net-energy community, and which has been ranked the most sustainable university in the world. Driven by local economic growth and the emigration of San Francisco Bay area residents, the home-buying markets in these two counties are poised to offer strong demand, much of it from buyers of the Millennial and Generation-X generations. In addition to its water-conserving solutions, the team believes Our H2Ouse stands out from other highly efficient net-zero-energy homes. The home features an adaptable and reconfigurable floor plan with a universally appealing open design and full Americans with Disabilities (ADA) accessibility. Its industrial, modern-rustic aesthetic design and versatile, trailer-mounted building structure is suitable for both urban and rural locations. Finally, it is designed to be a “green home” that its target buyers can actually afford. Our H2Ouse is intended to join UC Davis’ Aggie Sol 2015 Solar Decathlon entry as on-campus student housing focusing on sustainable, inclusive, living and learning. The houses also offer an additional agricultural focus, as they are in close proximity to the UC Davis Student Farm. Both houses will be featured during tours and events. The house will also act as a platform to test and optimize new and experimental home technologies.